CDIP's pressure sensors have recorded a number of tsunamis in Pacific waters. Data from these events are shared with the West Coast and Alaska Tsunami Warning Center and other institutions to help with their research efforts. For a brief description of tsunamis and their measurement, please refer to the Wave Measurement section of our documentation. 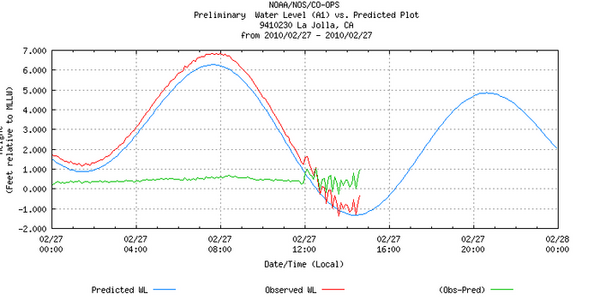 CDIP's Scripps Pier pressure sensor recorded a small tsunami event arriving at approximately 12:04 UTC on April 2. Preliminary analysis shows a trough-to-crest height of about 4 cm with a period of about 26 min. The March 11, 2011 earthquake occurred off the east coast of Honshu, Japan with a magnitude of 9.0. A tsunami was generated which was recorded throughout the Pacific Ocean. CDIP's Scripps Pier pressure sensor showed the tsunami signal arriving at Scripps at approximately 08:50 PST on March 11. 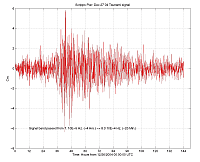 Preliminary analysis shows the tsunami arriving with an amplitude of of over 30 cm and a period of 36 minutes. 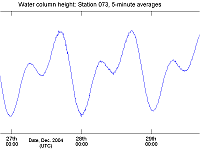 In San Diego Harbor the amplitude of the tsunami reached 2 feet. These photos show the change in water level at the Southwestern Yacht Club over a 10-minute period on Friday afternoon. Photos courtesy of Thomas Muschamp.